Tom Bradley was mayor of Los Angeles for 20 years. NBC ran Laugh-In when he ran for office; Britney Spears and Justin Timberlake were on TV when he retired. The sharecropper’s son was born in a log cabin in Texas, but moved with his parents to Los Angeles during the Great Depression. He was an athletic star at UCLA and joined the LAPD right after school. In 1963 he became Los Angeles’s first black councilman and six years later ran for mayor. When he lost the election to incumbent Sam Yorty, a conservative from the San Fernando Valley, some blamed Yorty’s racial scare tactics. Bradley’s long reign included the new Bunker Hill, the 1984 Olympics, the start of our light rail system, and the 1992 riots. 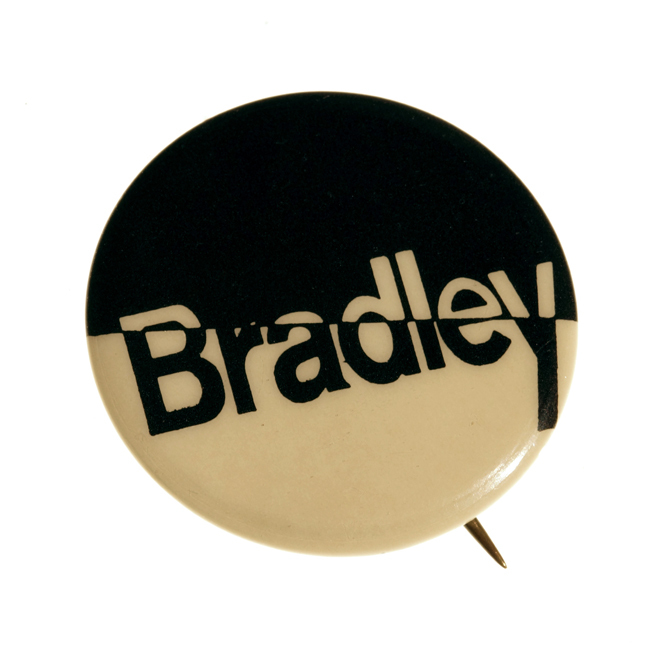 His 1969 campaign produced these pins with his name completing a circle of black and white. Button via Bridging The Divide:Tom Bradley And The Politics Of Race producers Lyn Goldfarb and Alison Sotomayor. Artifact courtesy of Bruce Corwin. Photography by Daniel Zimbaldi.